Reel Talk Online: First Look: "The Karate Kid"
First Look: "The Karate Kid"
I'm usually not a fan of remakes (but there have been special circumstances), however this updated version of the 1984 classic The Karate Kid doesn't look half bad. 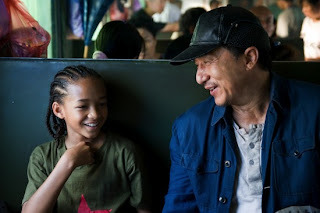 Starring Will Smith's son Jaden Smith, Oscar nominee Taraji P. Henson and Jackie Chan, this newly revised version follows twelve-year-old Dre (Smith) and his mother (Henson) as they migrate from Detroit to China where Dre goes toe to toe with a relentless bully (similar to the original film). Trouble is, the pint-size Dre is no match for his nemesis. That's when he meets martial arts master Mr. Han who teaches him the elements of street karate. This is pretty much the original '80s script with an urban twist. Looks like it might work though. Check out the trailer below. The Karate Kid is in theaters June 11, 2010. Will you watch it?